The company has its headquarters in Katerini, built in a privately owned property of 17.500 sq. m. with facilities covering 9.000 sq. 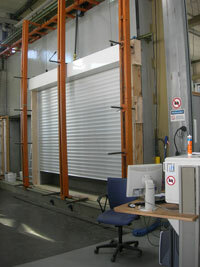 m. The company manufactures rolling shutters and garage doors on request. All of its products, such as aluminium – polyurethane sluts, boxes and accessories, are exclusively designed by the company itself and are sold in the market. It is a verticalized industry using state-of-the-art mechanical equipment, which includes: three production lines for aluminium – polyurethane sluts, two production lines (extruder) for plastic profiles, ten injection motors for producing plastic accessories, four motors for producing metallic accessories, and finally other mechanical equipment (such as saws, air compressors etc.). ROLKA S.A. has been ISO 9001:2008 certified by the international certification organization TUV-HELLAS for designing and producing rolling shutters. The products were submitted to wind resistance and energy transmittance testing by the internationally accredited German Institute IFT ROSENHEIM. All of our products bear the stamp CE. Constant control of the manufacturing process guarantees the high quality of all products.